Somehow, in the long day and night that he was rescued and given to WWF’s care, my little “man of the forest”—a tiny baby orangutan with a nimbus of red hair—managed to lodge himself in my heart. I met Baim—incongruously named after an Indonesian celebrity—in the Heart of Borneo, a forest region on the island of Borneo. Baim was in a cardboard box lined with newspapers and crying for his mother, terrified to be without her and surrounded by strangers in a place far from home. We locked eyes as his fingers desperately clung to mine. He should’ve been latched on to his mother instead, knowing that she would be there for comfort and nourishment. He should’ve had years of learning from her ahead of him—what to eat, how to build nests, where to find his kind. His playground should have been the tree tops of shady forests until he matured into an adult. Instead he faced a future that would take him deeper into human territory before offering any hope for a return home to the forest. Baim’s cries were heard by two men hunting for frogs in the forest. They waited four hours for his mother to return. The men knew that a mother orangutan would never willingly leave her infant behind and was instead likely the victim of poachers, so they took Baim to their longhouse. They could’ve sold him into the pet trade, but chose to hand him over to the national park ranger who notified WWF staff. After meeting with senior district officials, WWF was given responsibility to take Baim to the provincial headquarters. There he was placed in a rehabilitation center. For most of the five hours bumping over rough roads to the nearby town, he squeezed his eyes shut and clutched my finger, pulling it close to his face. 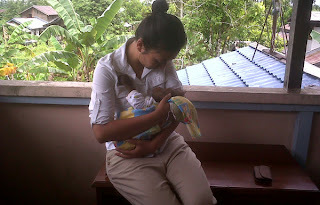 That night he was inconsolable in his makeshift crib until he found a safe place in the crook of my arms. We both fell into an exhausted sleep on the floor of the WWF office. Saying goodbye the next day was not easy. I was embarrassed to cry in front of the staff as I held Baim close one last time before leaving for the airport to fly back to my family in the U.S. Before leaving, I whispered in his ear that I’d pray he would one day find his way back home too. 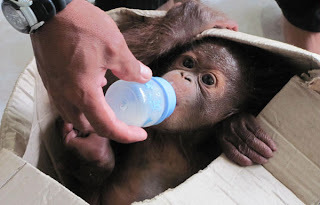 Baim now lives with more than a dozen other orangutans in Ketapang Orangutan Centre of International Animal Rescue. He will grow to adulthood there and like the others, wait for a future that will return him to the forest. Progress is being made to protect orangutans and their homes. In 2007, the governments of Indonesia, Malaysia and Brunei signed a historic agreement to save the Heart of Borneo. WWF is working with these nations to conserve 85,000 square miles of rain forest—about the size of the state of Utah—through a network of protected areas and sustainably-managed forests. Indonesian President Yudhoyono also outlined a national strategy in 2007 to protect orangutans, stating that by 2015 all orangutans still in rehabilitation centers would be returned to the wild. What we need now is to move good intentions to real action. It’s the only way to ensure that Baim will have a place to call home.